While older women often look forward to their role as grandmothers, they nonetheless are always and still mothers to their adult children. And sometimes the circumstance of being an older mother to older children can have its own complications. 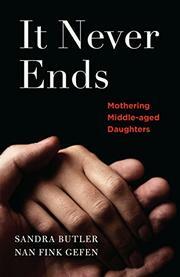 In their just published new book, It Never Ends: Mothering Middle-Aged Daughters, authors Nan Fink Gefen and Sandra Butler describe the complexities and conflicts of navigating the role of being an older mother to mid-life daughters who have their own lives and families. Through a series of interviews with dozens of women ages 65-85, the authors detail the essential recalibration of this seminal relationship as both sides age and change. It’s a useful examination of what can be both a wonderful and maddening time for each, from authors who have a wealth of professional and personal expertise. Read more about the book, and the authors, Here.